Sometimes necessities brings the same happiness what luxury at once brings. A rented apartment for a bachelor or a bungalow for a family person? The question is… does happiness comes from the necessities with standard of living? If you ask a mid-twenty guy to buy a penthouse, he would rather feel bit of luxury in it. But the same is a happiness for a man who is having a family. Likewise a car is beyond happiness and luxury for a teenager but the same is a necessity for office goer in a city like New Delhi. The generic way that we usually feel is happiness is an excerpt of a lifetime that comes in different colours along with age, time, environment and events. A marriage, anniversary or birthday are such personal events in a lifetime that no doubt brings happiness every time. Such as professional events like promotion and incentive tours. Happiness is the core essence of human life and the principal driver of all our actions. The search for happiness and the subsequent pursuit for it is the stuff our lifes are made up of. Little joyous moments, Big happy moments and life changing happy events. Happiness in other words is a state of well-being characterized by emotions ranging from contentment to intense joy. But can we measure happiness? LG did a nation-wide survey that covered 16 major cities with a target age group from 18 to 45. The study was hived off in both qualitative research, which started from 21st March, 2015 and continued till 24th March, 2015 and quantitative research that followed with face to face interaction using structured questionnaire sought on 28 parameters in terms of levels of happiness. The LG India happiness study followed with various domains of happiness – pursuit, purpose, pleasure, passion and context… thus contributing towards LG happiness index. It summed up with relative happiness of various demographic age group and cities. The extensive study on India happiness also succeeded in gauging happiness in various aspects of life followed by concluding it with the major cities of India. It’s worth mentioning that Chandigarh excelled as the happiest city. Patna, Pune and Bhopal hovered closely, whereas the city of Nawabs, Lucknow, strikingly took over Delhi, Chennai, and Bengaluru followed by Bhubaneshwar and Kolkata. 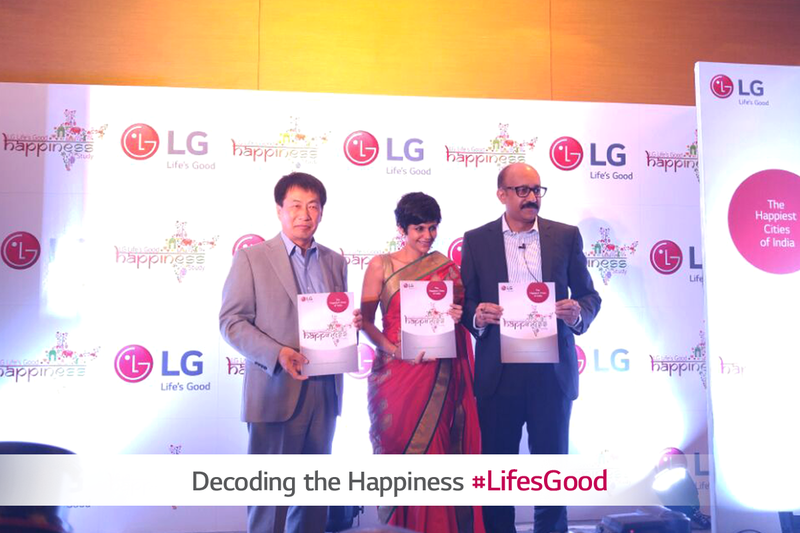 The LG India Happiness Study was later followed by a lively event in New Delhi with the presence of talented Miss Mandira Bedi, moderator; Mr. Soon Kwon, MD, LG Electronics India; Mr. Niladri Dutta, Head Corporate Marketing, LG Electronics India; Dr. Amrit Srinivasan; Mr. Priyadarshini Narendra, VP, IMRB. The event was addressed to media journalists where key notes on the India happiness study were shared and LG India Happiness Study report was unveiled.